Last week we had the honour of visiting Fred. 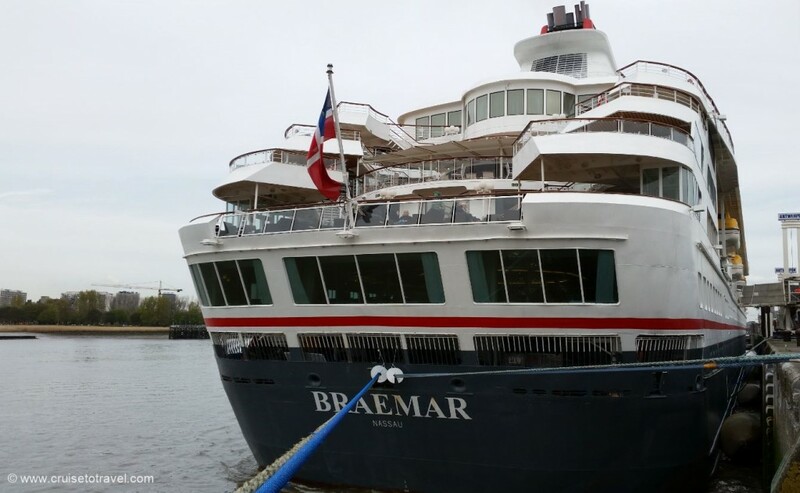 Olsen Cruise Lines’ MS Braemar when she was docked in Antwerp, Belgium. UK-based Fred. Olsen Cruise Lines is part of the Fred. Olsen group, a Norwegian company which can be traced back to 1848 when three Olsen brothers – Fredrik Christian, Petter and Andreas – bought their first ships and began an international shipping company. Five generations later the Olsen family operates companies skilled in various aspects of the cruise and passenger shipping trade as well as aviation, ships’ crewing, shipbuilding and offshore industries. The Fred. Olsen group also has interests in the luxury hotel sector, estate management, property development, and electronics companies. Fred. Olsen Cruise Lines operates four smaller scale cruise ships with a traditionally British ambience on board. Part from Braemar, the three other ships are Black Watch (804 passengers), Boudicca (880 passengers) and Balmoral (1350 passengers). 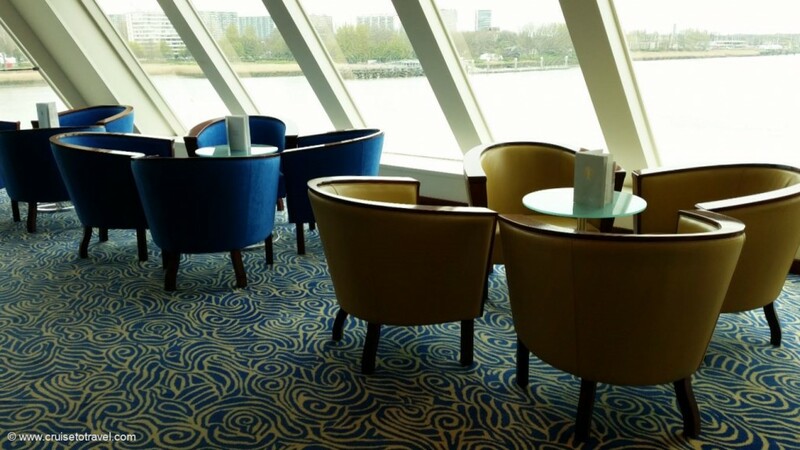 Constructed in 1992 for Crown Cruise Line, operating under the name Crown Dynasty, the ship has sailed under different names and for different owners. 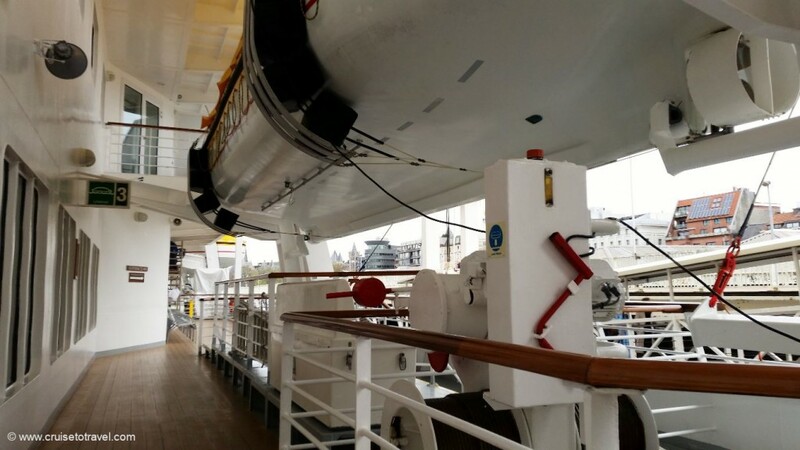 Between 1993 and 1997, the ship was chartered by Cunard Line, sailing as Cunard Crown Dynasty. In 1997 the ship was transferred to Majesty Cruise Line, which renamed her Crown Majesty. At the end of 1997 she was transferred again and became Norwegian Dynasty sailing for Norwegian Cruise Line. In 1999 she returned to her original name, Crown Dynasty, and enterred service with Commodore Cruise Line. Finally in 2001 she was sold to Fred. Olsen Cruise Lines who renamed her Braemar. 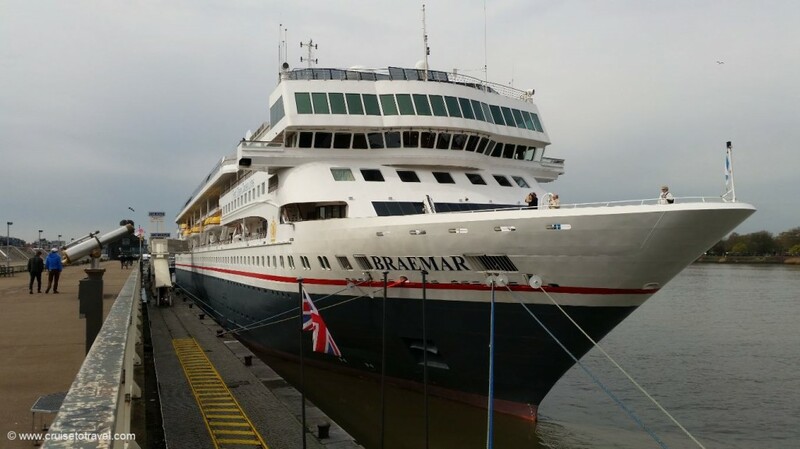 As part of a major refurbishment in 2008 Braemar was cut in half and a 31.2 meter midsection was added to the ship, increasing her passenger capacity from 729 to 950. 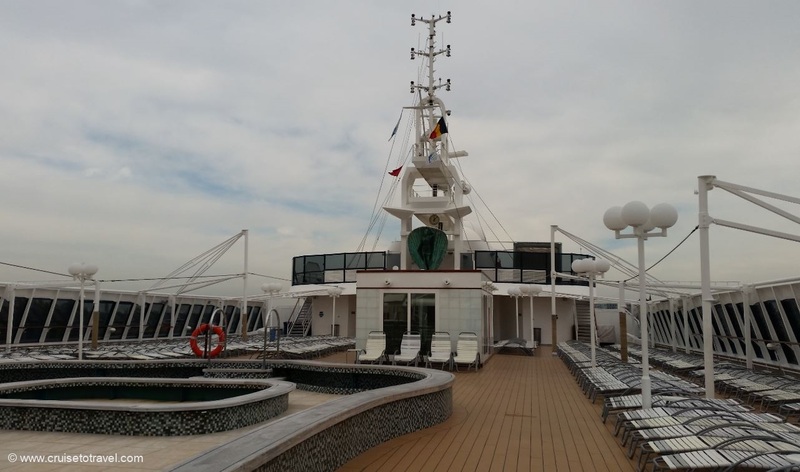 As soon as we cleared security we boarded Braemar on deck five. Part from deck eight, which is the outside deck, deck five is the central deck on the ship where all the public areas are located. There are no staterooms on this deck. 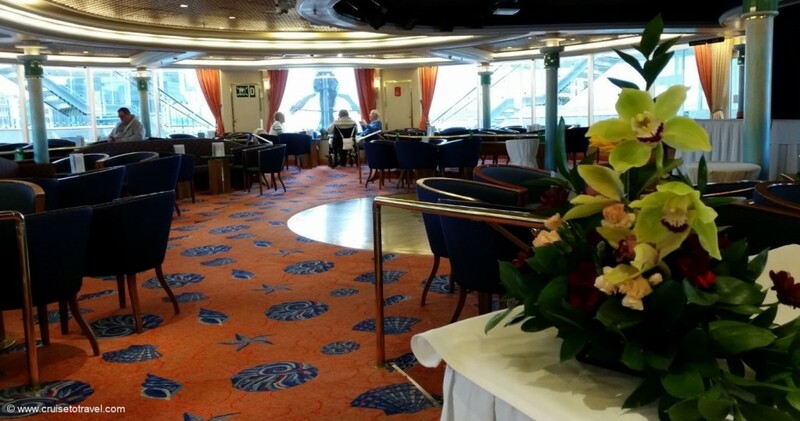 We started our tour in the Coral Club, which is located at the back of the ship. 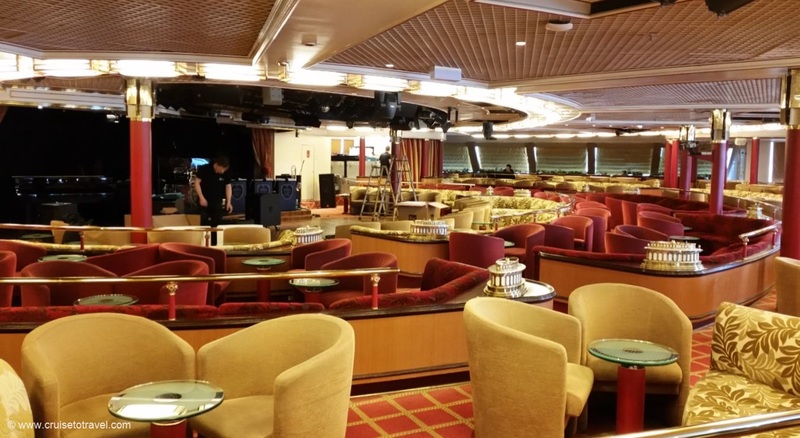 Together with the Neptune Lounge, the Coral Club lounge is the venue for evening shows, dancing to resident live bands as well as occasional late night cabarets. It is the place where traditional afternoon tea is served and the location for a game of Bingo and other daytime activities. As we walked towards the front of the ship we passed by the Guest Services desk. 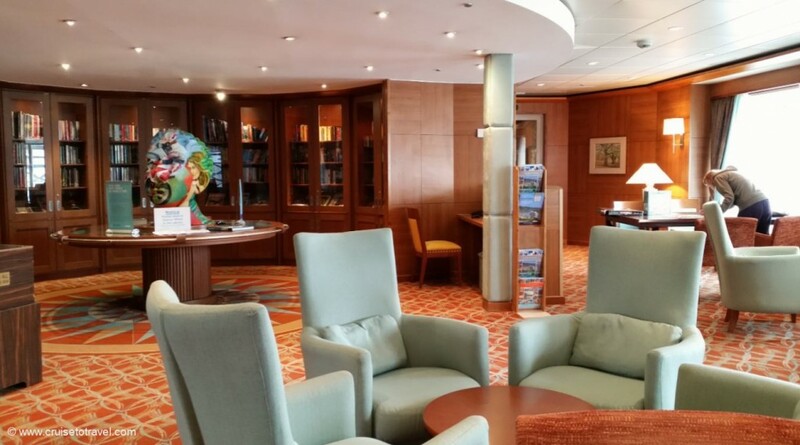 Located at the heart of the ship, the Guest Services Team are on hand 24 hours a day, to advise and answer any questions guests may have. 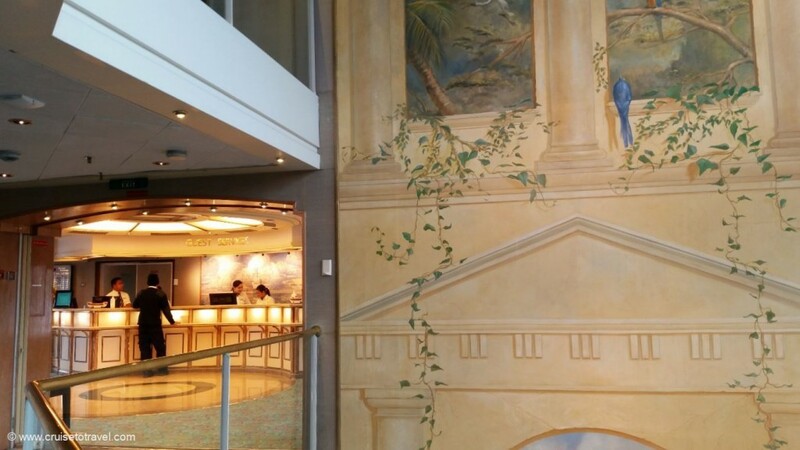 One of the focal points on Braemar is a beautifully painted, four-deck high small Atrium which connects the Fitness Centre, Palms Café, Coral Club and the Thistle Restaurant. 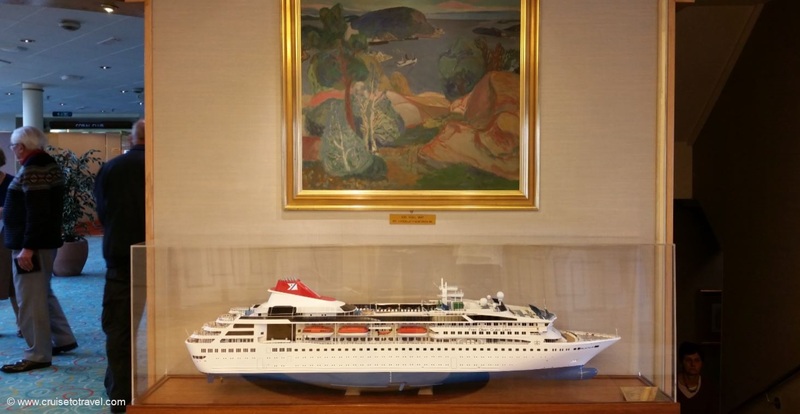 Right in front of the Guest Services desk is a scale model of the original sized Braemar. 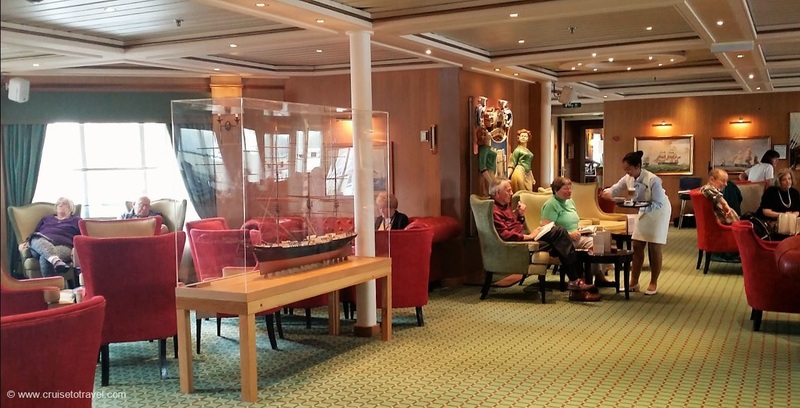 As I mentioned before deck five, or the Lounge deck, is the central deck onboard MS Braemar. 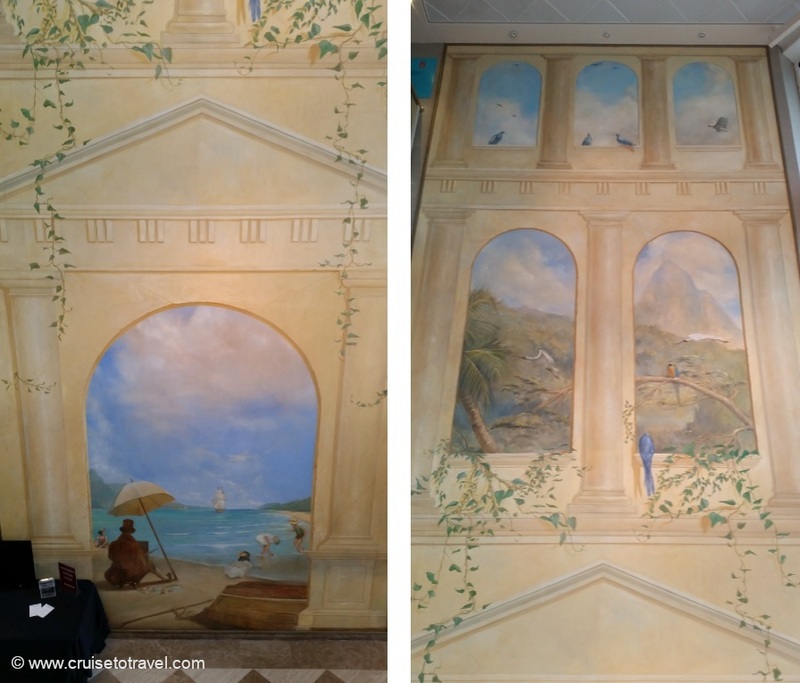 Here you will find the Photo Gallery and Shop, some boutiques, the Shore Excursions desk and the Future Cruise Desk. We continued our tour through the Bookmark Café, Braemar’s Chocolate and Coffee Café, which offers guests a selection of speciality coffees and teas and luxury chocolates. 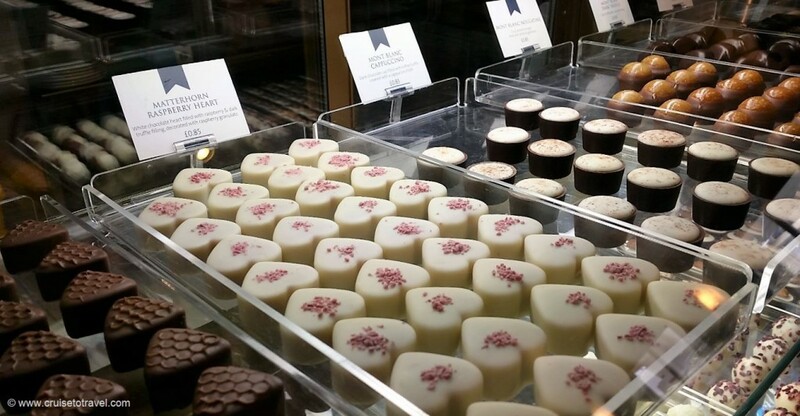 Luckily we were not passengers on this cruise ship or we would have been tempted to try the large selection of quality chocolates, from Pralines to Champagne Truffles. Next to the Bookmark Café is the Library. Part from carrying a large selection of books the mahogany covered library is also stocked with a selection of board games, CDs and DVDs. Walking past the Library we entered the Morning Light Pub, Braemar’s own local pub. The bar resembles a traditional English pub thanks to it’s classic style, depicting the century and a half of Fred. Olsen history. It is the ideal location to socialise with friends while being entertained by live music or stand-up comedians. In the front of the ship is the Neptune Lounge, Braemar’s main entertainment and cabaret venue. 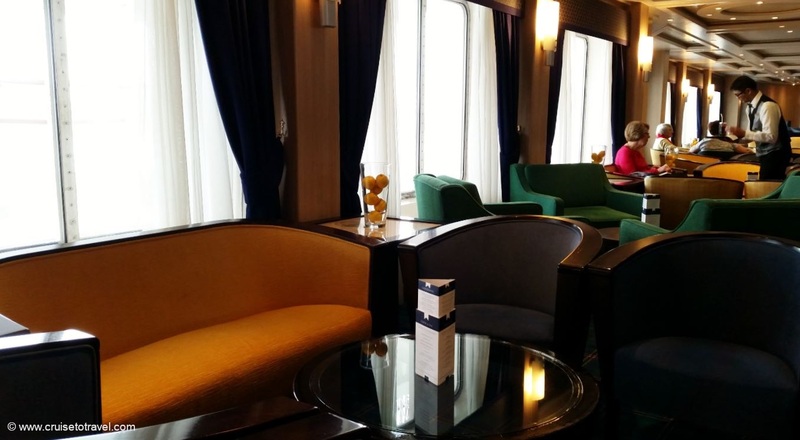 Together with the Coral Club, the Neptune Lounge forms the center of entertainment onboard MS Braemar. Both venues offer two performances per night, giving guests a chance to see the show regardless of their dining time. With a quick look outside at the promenade, which runs all the way around the ship, we ended our tour of deck five. As we went back inside we took the elevator up to deck 8, the Marquee Deck. All the way at the front is the Observatory, where large windows give panoramic views of where the ship is going. 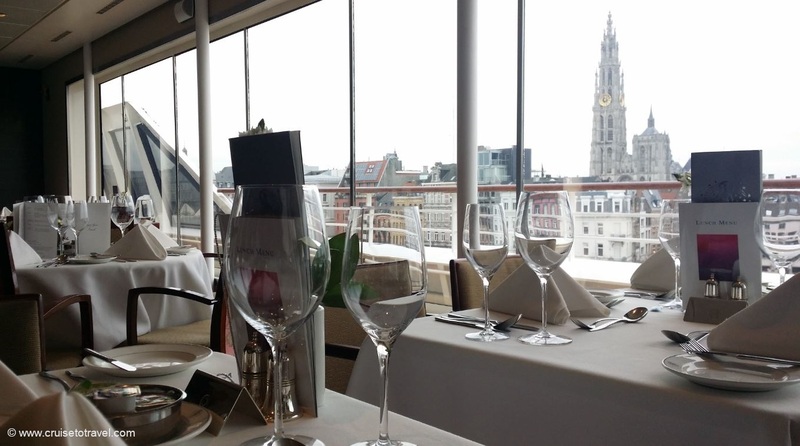 With a grand piano providing background music it is the perfect location to enjoy pre-dinner drinks and cocktails. 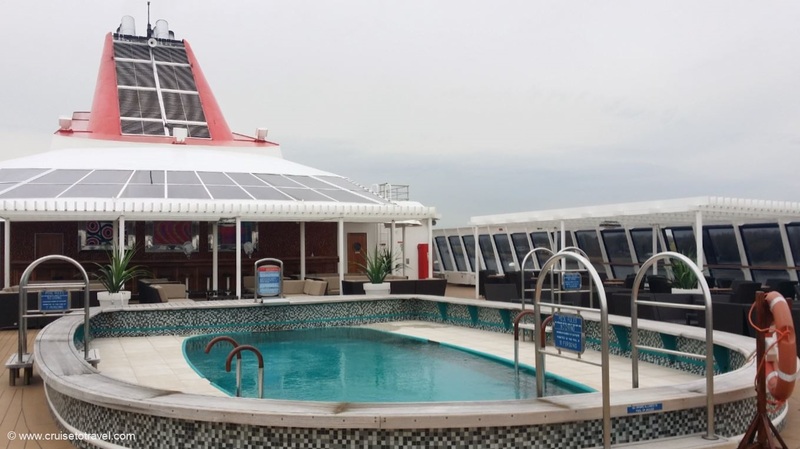 Going outside, towards the back of the ship, there is a paddling pool, two jacuzzis and two swimming pools filled with sea water. Before leaving the pool area you might want to grab a drink from the Marquee Bar. Going back inside we had a quick look inside the Grampian Restaurant, one of the two a la carte restaurants onboard Braemar. 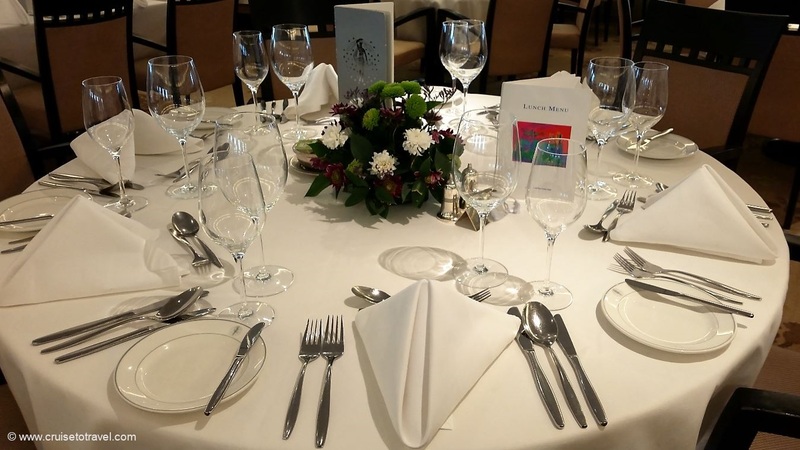 The smaller Grampian Restaurant offers a more formal dining experience in an intimate setting. One deck below we walked into the Fitness Centre, where classes in yoga, pilates or fitness are offered under the supervision of qualified instructors. The gym is equipped with all the modern facilities you would expect. 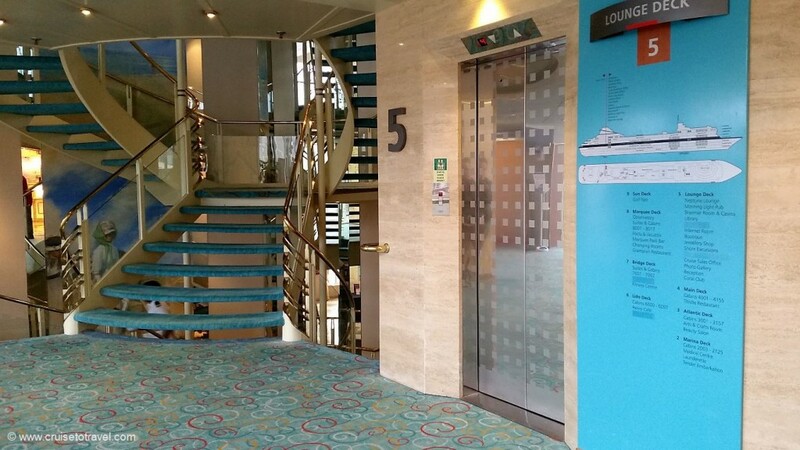 Fully inspired from our visit to the Fitness Centre we took the stairs going down, passing by the Palms Café on deck 6. Thanks to the buffet style of service, this is the ideal place to have a meal which is less formal or when you prefer not to stick to the set dinner times. Our last stop on this visit was the Thistle Restaurant on deck four. 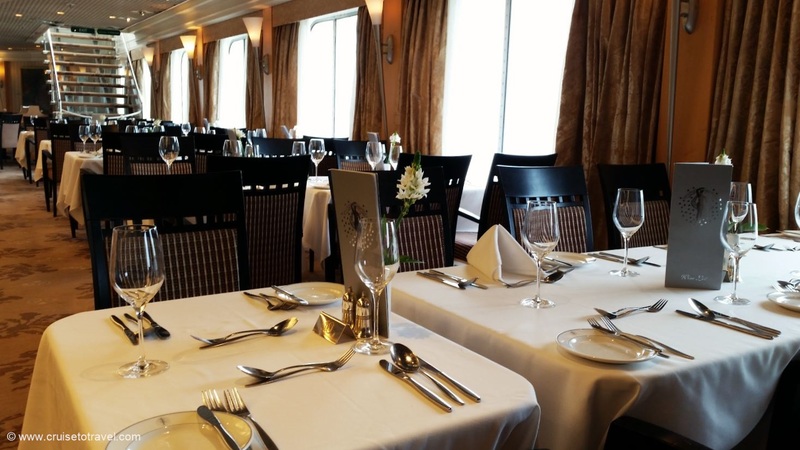 The main restaurant onboard Braemar is surrounded by ocean views and offers a la carte dining. It is open for breakfast, lunch and dinner. 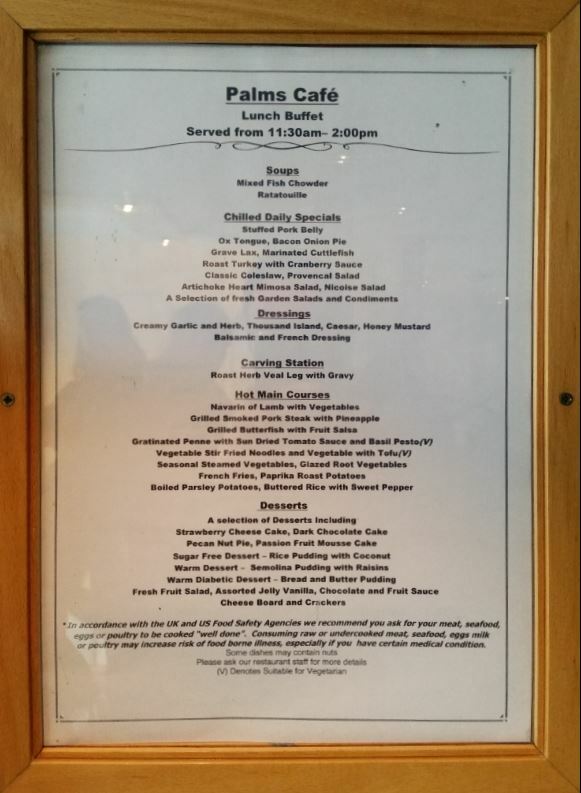 During our lunch we had the option to choose from the a la carte menu, the buffet or a combination of both. Red and white wines were included. While I opted for a la carte lunch, some of my table companions went for the buffet. 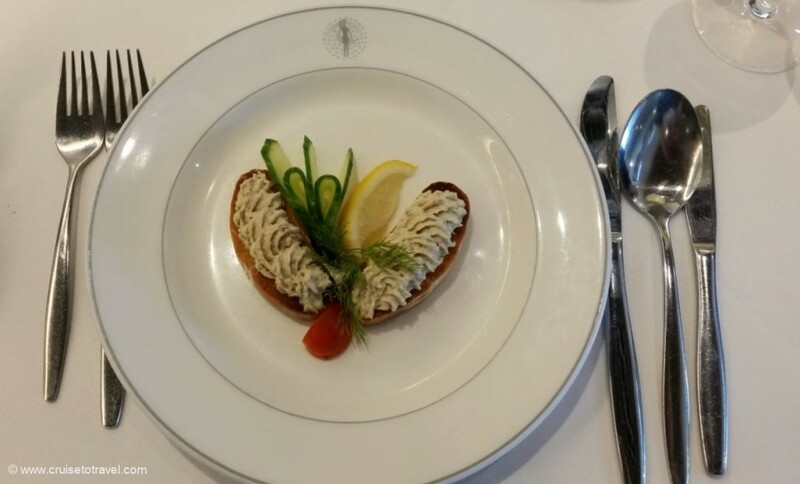 The starter, the Smoked Fish Tapenade was very nicely presented and tasted very good. Being a guest on the ship, ordering a second portion would have been impolite. As I wanted to have a closer look at the buffet later, I decided not to order a soup or salad, though I must admit the Mixed Fish Chowder soup and Filipino Beef salad looked very tempting. Not completely sure if eggs on a toasted brioche would be my thing, and since I am not a big fan of lentils, I ordered the Sweet and Sour Chicken as a main course. Presentation wise the main course looked very acceptable to me. 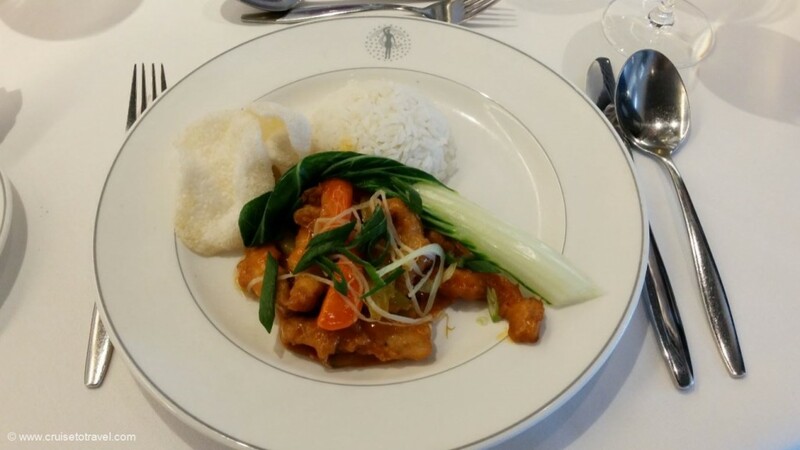 Though the Sweet and Sour Chicken tasted good, in my humble opinion, it did not match the quality of the starter. 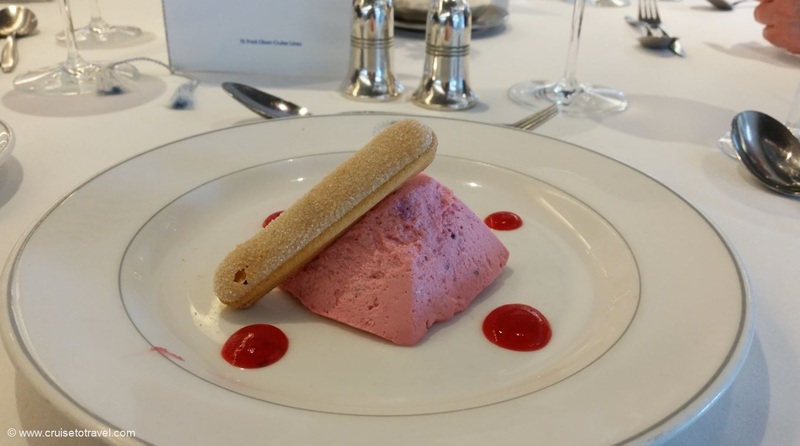 One of our favourite things on a cruise ship is trying out the desserts. Not wanting to be ill-mannered we decided we would both order only one dessert which we would share. 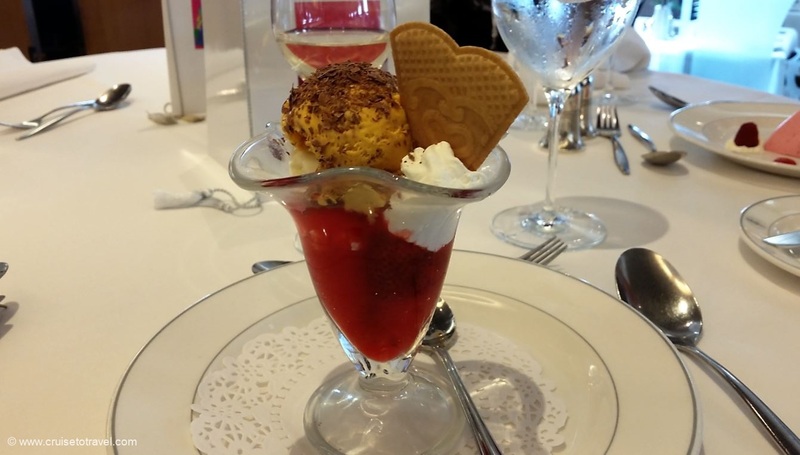 The Fresh Fruit Mousse and Eton Mess Sundae were absolutely yummy (and to be honest I did eat most of them). 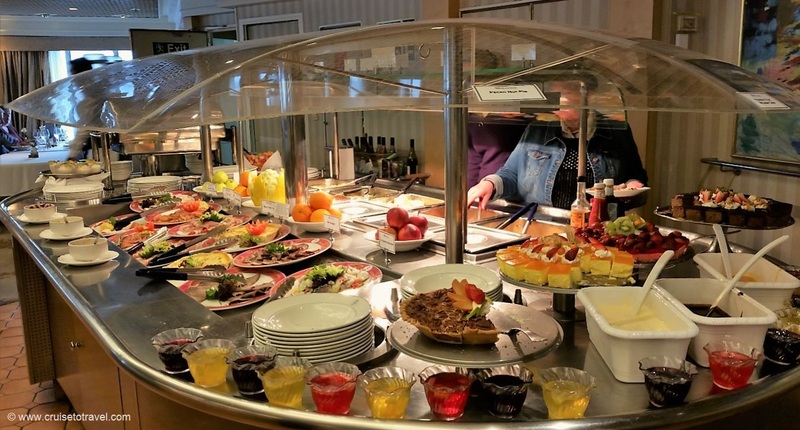 Having finished our desserts I went over to the buffet counters to see what was on offer. 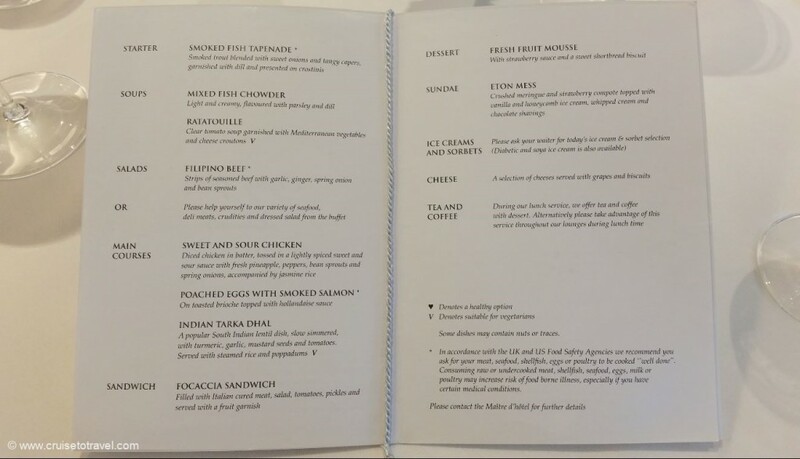 While the first counter offered everything cold (meat, fish and vegetables), the second counter had a small selection of Asian, Italian and American dishes and warm vegetables on offer. Both had a nice selection of desserts including fruit mousses, pudding and cheese. After we finished our lunch it was time to head towards the promenade on deck five, hand in our visitors badge and disembark the ship. Looking at the outside of the ship you would not say this lady is 23 years old. Thanks to her dark grey hull topped with a red line she looks much younger and has a modern and elegant appearance. On the inside Braemar continues that elegant look with a classic interior. The vast collection of paintings and ship models refer to the history of Fred. Olsen Cruise Lines. Although Braemar is a small and intimate cruise ship, she still offers everything you need for a comfortable and stress-free cruise. Some facilities, the self-service laundry for example, are unique as they are not offered on more recent and bigger ships. 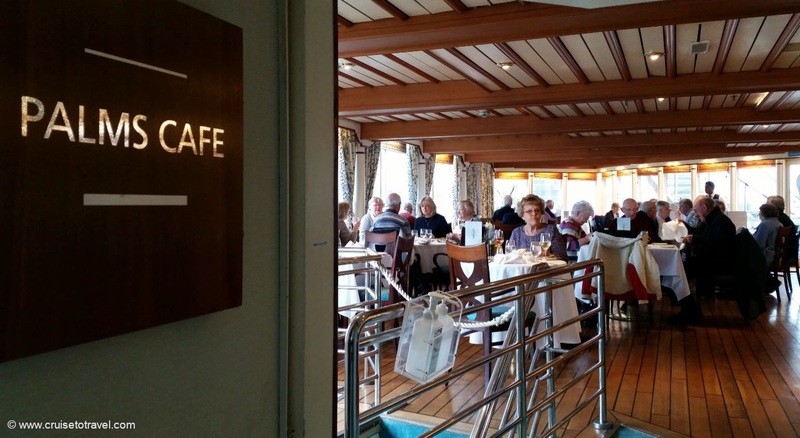 And you may not expect it but Braemar does offer WiFi throughout the vessel. 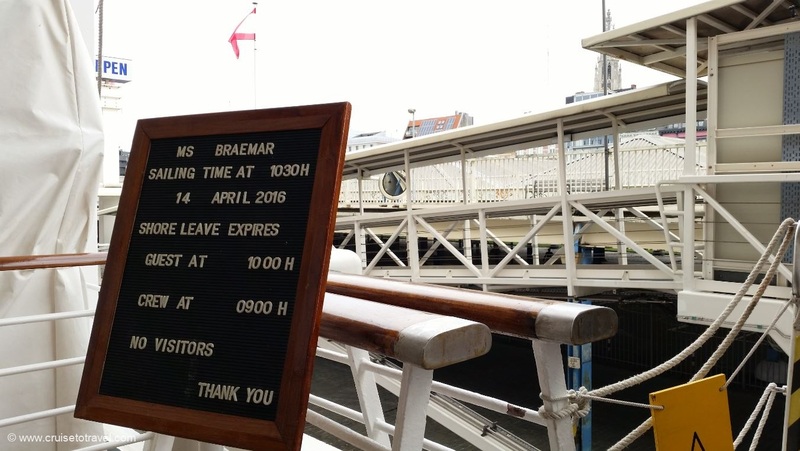 If you are looking for an active vacation on a ship with all the bells and whistles that are installed on recent cruise ships, Braemar is not the ship for you. 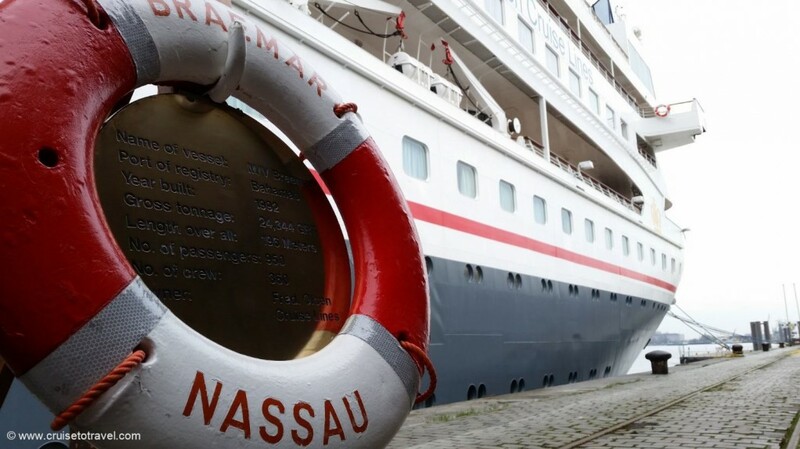 If you do not need a rock climbing wall, an ice skating rink, an aqua park or a ropes course but are looking for a relaxed cruise experience on a smaller ship with great personal service, Braemar, together with the three other ships in the Fred. Olsen Cruise Lines’ fleet, might just be the cruise ship you need.